Next to the beach at the Kolymbia resort in Rhodes, Greece, Atlantica Aegean Blue is an ideal destination for families, couples, solo travellers and large groups. 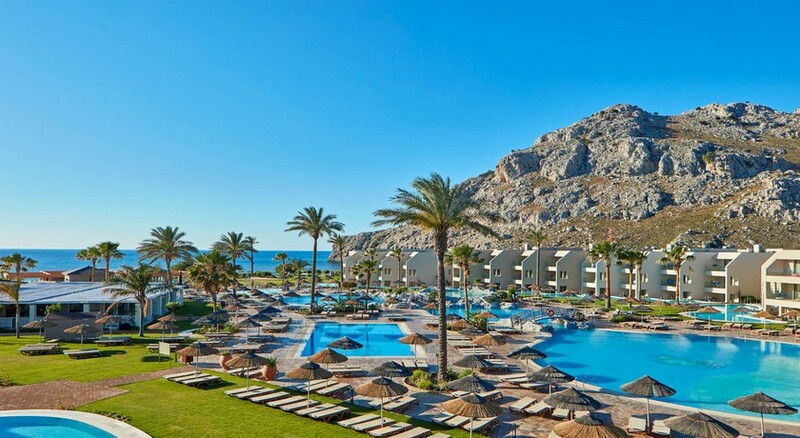 This 5-star beachfront hotel is a 15-minute walk to Kolymbia town centre which buzzes with a variety of restaurants, bars and local shops, it's also close by to Rhodes Town and Lindos. 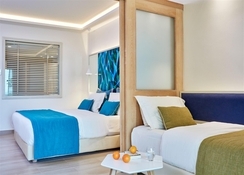 The well-furnished rooms offer spectacular views of the Mediterranean Sea, with a variety of Twin and Double, Family and Premium rooms available. There are pools and gardens outdoors fit for lounging, while the on-site waterpark ensures a fun-filled day out for adults and kids alike. With attentive service, a range of buffet and a la carte restaurants, bars and lounges, private parking, indoor and outdoor games, entertainment programmes and a fully-equipped gym, Atlantica Aegean Blue Kolymbia ticks all the boxes. Atlantica Aegean Blue is beautifully set right by the beach and is nearby to some of the island's key places to visit. The Kolymbia town centre is approximately 800m away and the bus stop is located right outside the hotel with regular connectivity to Rhodes Town (21km), Lindos (35km) and Faliraki (8km) for fun-loving days out. The Diagoras International Airport is closest to the resort, approximately 31km from the hotel property. The luxury seaside resort offers a varied selection of room types that are divided into double rooms, family rooms and family suites. All rooms are beautifully designed and offer amenities such as en-suite bathrooms, hairdryer, a mini fridge stocked with refreshments, air conditioning (mid-May to September end), tea and coffee making facilities, Wi-Fi and a safety deposit box. 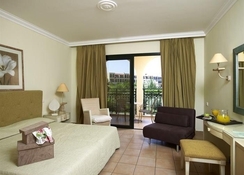 You can choose from a variety of rooms offering views over the garden, pool or glittering sea. Atlantica Aegean Blue Rhodes offers a total of nine great restaurant, lounge and poolside bar options for food and drink. Thalassa Restaurant & Al Fresco Terrace is the main restaurant serving a buffet breakfast and dinner menu, along with an la carte lunch and midnight snacks. Italian and Greek cuisines are served at La Trattoria Italian Restaurant (open mid-May to mid-October) and Taverna Greek Restaurant respectively. 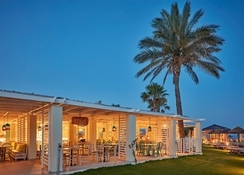 The Asia Lagoon Restaurant (reservation is required) set on a lagoon is a fantastic venue to savour Asian delicacies, while The Mesogios Pool Bar, Relax by Blue Bar and Atlantis Lounge Bar & Terrace serve alcoholic drinks, coffee, smoothies and ice cream. Thia’s Coffee Shop & Juice Bar and Aegean Snacks also serve light bites and beverages. There's a host of recreational activities available in Atlantica Aegean Blue, including multiple swimming pools for both adults and kids with complimentary parasols, loungers and towels. There is a wide range of indoor and outdoor sports and fitness activities on offer such as table tennis, beach volleyball, tennis, darts, archery, water polo, aerobics, aqua aerobics, pedal boats, canoe and watersports (extra charges). 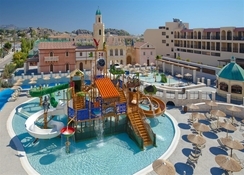 The on-site exclusive water park features splash areas and waterslides (fun for both kids and grown-ups) including a space boat, black hole-rafting slides, kamikaze, freefall and the ultimate lazy river. In the evening, the hotel organises entertainment 6 days a week - perfect if you prefer to relax in the resort. · Additional fees may apply for certain facilities, amenities or activities.